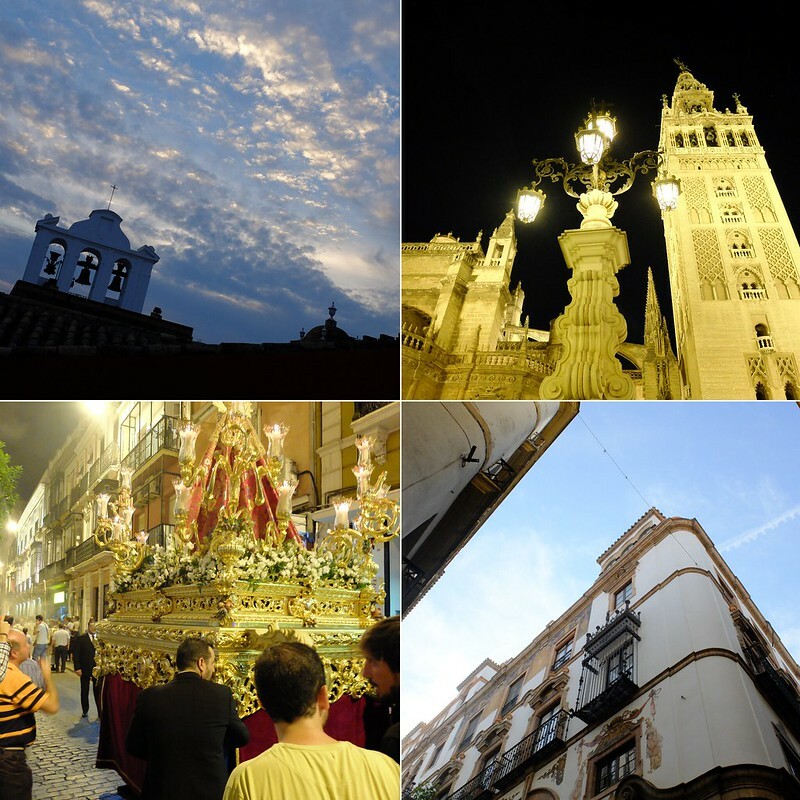 For our honeymoon we visited Seville, Granada and Nerja, in Spain's wonderful Andalucia region. Seville, our first stop, was a classy city. We arrived by train from Malaga, and took a taxi to our rather swish hotel. A quick freshen-up and a spot of cava, and we were ready to hit the town. Clockwise from top left: View from our terrace, Seville Cathedral, historic buildings, stumbling across a religious procession. We had drinks on a hotel terrace, overlooking the cathedral. I sipped cava and watched bats swoop from the bell tower. They were huge bats, certainly not the usual British pipistrels! 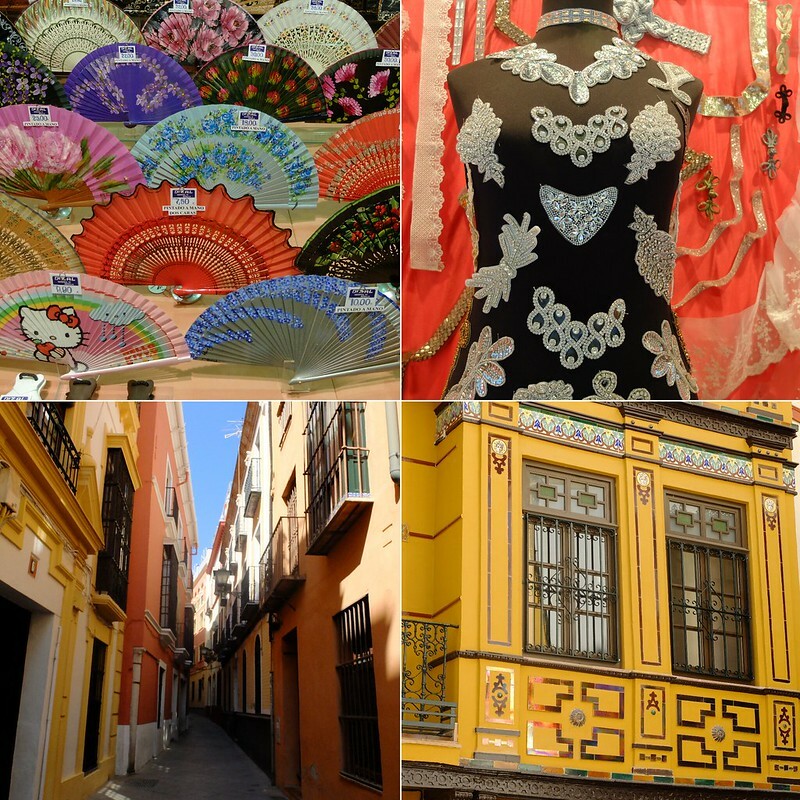 Wandering around the streets is wonderful in Seville, there is so much to take in. The shops in the district near where we were staying were incredible. A mix of olde-world shops full of fans or hats, mixed with boutiques selling unique couture clothing, heavily influenced by both flamenco and vintage '50s/'60s - there were lots of full skirts in gorgeously tactile fabrics, with lofty price tags. Clockwise from top left: fan shop, haberdashery, covered balcony detail, winding streets. We called in to a few places for drinks and food, ending up walking along the river. Crossing the Triana bridge, I had the romantic notion to give my new husband an engraved padlock I'd commissioned for our honeymoon. The idea was to attach it to the bridge alongside all the other padlocks, or 'love-locks' as they're known. Alas, I had unknowingly purchased a sort of mini padlock, which couldn't get around the thick railings! We searched for the rest of the honeymoon for somewhere else suitably romantic to attach a love-lock, but we couldn't find anything so we've brought it home again. It's the thought that counts. We attended a fabulous flamenco show on our second night, we walked miles to find it only to discover it was practically next to...our hotel. Ah well, it's not a holiday unless you get lost at least once! 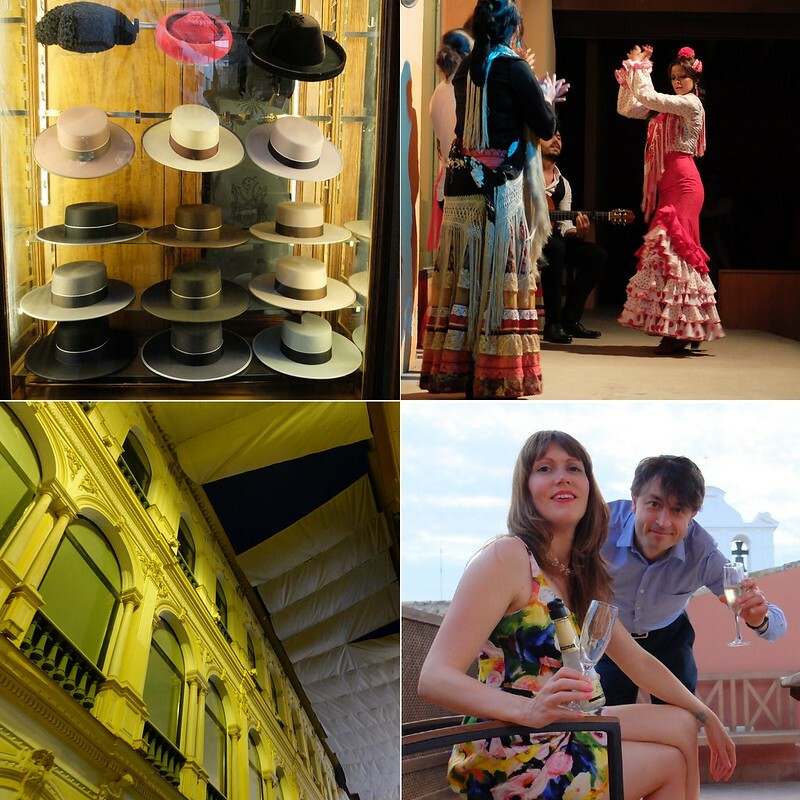 Clockwise from top left: Milliners, flamenco, sunset drinks, covered streets. Seville is inland and can get blisteringly hot, but what I loved was how cool the mornings were - because the buildings are so close together, and most pedestrian shopping areas are covered with giant 'sails', it's deliciously cool until later in the morning, meaning you can get a head start on your sightseeing or shopping without melting. It got up to about 36 degrees while we were there, and normally I can't do anything in those kind of temperatures, but we managed to see a fair bit, including the wonderful Plaza Espana, the old tobacco factory that inspired the opera 'Carmen' (now the university, where they ironically had on some kind of psychology conference, do you reckon I could get work to send me there next year?!) and the old Jewish quarter. I loved the historic buildings, the narrow alleys between them, all the little bars and restaurants spilling out of unlikely looking doorways. I would go back to Seville in a heartbeat - it was a wonderful city, and we barely scratched the surface in our two nights there. Next up...Granada, and the Alhambra palace! What a beautiful place to have a honeymoon. That place looks amazing and I love the little shops! The paddlock idea was a great one too bad it didn't fit on anything. Like you said it was the thought that counts! I can't wait to hear what you did in Granada. I was there a couple of years ago and LOVED it. We went to see the most amazing flamenco show in very old caves on top of a mountain. I'll never forget it. That sounds like such an engaging, fantastic quick visit to Seville. Thank you for taking us along with you guys - I'm really excited to see Granada and Alhambra as well (avid armchair traveler that I am :)). Beautiful pics and love your fun vibrant dress! I adore Seville. We honeymooned there and have been back twice since. We always have to go to the Alcazar (Royal palace, not far from your hotel) as architecturally it's a mini-Alhambra and the gardens are just beautiful, and to the Plaza de Espana because it's such an extraordinary building we've never been able to photograph it despite many, many attempts. Otherwise, as you say, just wandering is superb. Did you do any shopping? I'm always so tempted by the jewellery shops on Calle Sierpes! Wow, Seville looks amazing! The colours everywhere are just so vibrant. I love all those sparkly embellishments and I would've been so tempted to buy one of those matador hats with the wide brim! I mean seriously, how good would that look with a 1950s new look dress? And 36 degrees, OMG I'd die. I'm having trouble at 25+ depending on how humid the air is. Sounds like such a romantic and lovely honeymoon! That's so absolutely lovely about the buildings making a kind of sail keeping things cool until later in the morning.